The origins of the noun fetish stem from the17th-century Portuguese word feitiço meaning “charm or sorcery,” and the Latin word facticius meaning “made by art.” In Native American culture, it represents a found rock or pebble that resembles an animal, which may be carved to enhance the image, and imbued with a spiritual power or “medicine.” Native Americans have carried these talismans for more than a thousand years. Fetishes have served as empowering reminders of the human connection to nature and to those qualities the animal reflects, such as agility, perseverance, independence, and survival. Mountain lion medicine reminds us to establish healthy boundaries and be a good example to others. 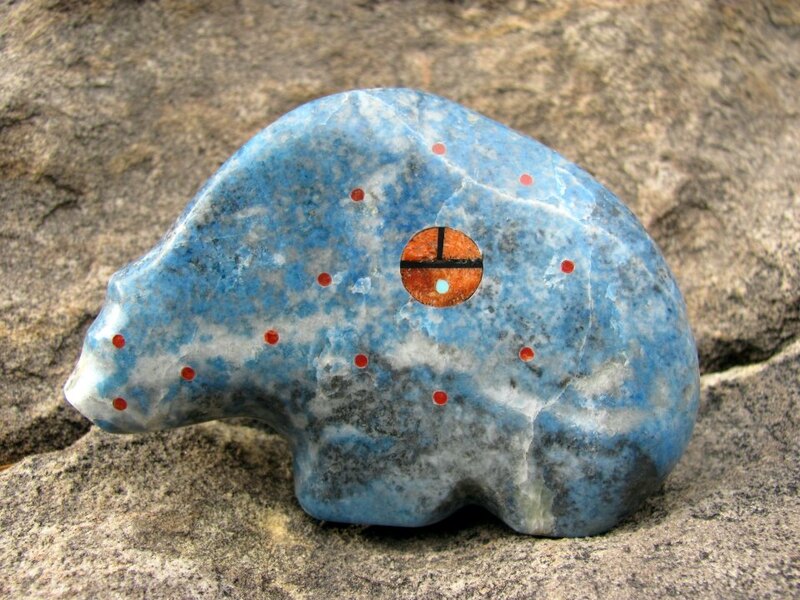 A bear (the most sacred fetish for the Zuni) represents healing, protection, strength, and mothering. There is no limit to the talisman forms that will offer its bearer that extra “magic,” or sense of whimsy that brings a smile. The fetish keeps up with the world’s changes and you can find many modern influences in the art form. Of all the Native American tribes, the Zuñi are the most widely known today for their outstanding quality of fetish art and craftsmanship. The Zuñi Tribe is distinct in many ways. Zuñi Pueblo is the largest in New Mexico, comprising about 450,000 acres overall, which includes land holdings in Arizona. Their native language is unique and bears no relationship to any other language in the world. Throughout the challenges of wars, invasions, and outside religious influences, the Zuñi have remained steadfastly devoted to their cultural and religious traditions. There are an estimated 12,000 Zuñi people, and nearly half of the Pueblo population lives below the poverty line. 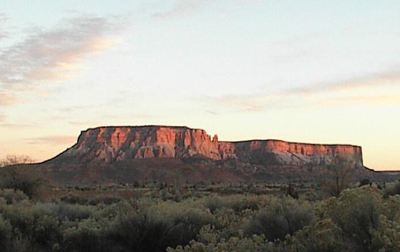 The Zuñi Pueblo is located 150 miles west of Albuquerque and 35 miles south of Gallup in a valley of rolling hills and glorious mesas. Creating a bridge between the Zuñi artists and the rest of the world is a small Santa Fe shop called Keshi: The Zuñi Connection. (Keshi, pronounced kay-SHE is the traditional greeting of the Zuñi, meaning “Welcome.”) The stewards of the Keshi shop are Robin Dunlap and her daughter Bronwyn Fox-Bern. In 1979, Robin was living in Santa Fe and working as a substitute teacher. She went to the local Education Department in search of a more fulfilling situation and asked whether they had a pool of qualified teachers that could be called upon by a community in need. The response was, “No.” Robin suggested they start one and left them her name and number. She returned home that day to a ringing phone. The Zuñi Public Schools were in need of a sixth grade teacher. Two weeks later, Robin packed up her nine-year-old daughter Bronwyn and moved to Zuñi. 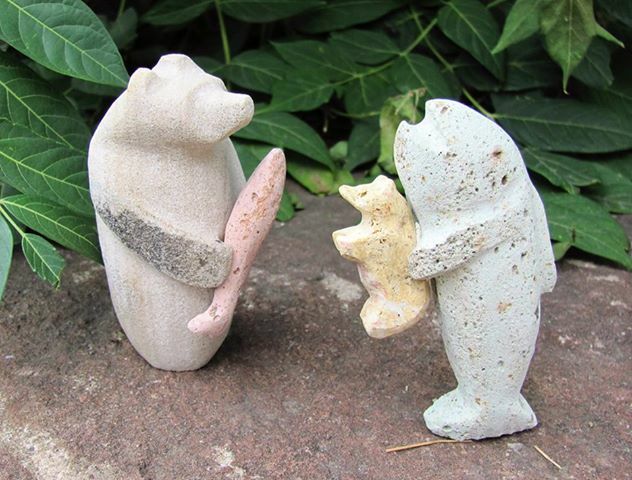 In 1981, Robin and a small group of Zuñi artists and school teachers started an artists’ co-op to be located in the state’s capital, so that Zuñi artists would have their own representation outside the reservation. Items were to be stocked on a consignment basis, and the artists would be paid their full asking price for each piece. A shop manager was hired and Robin stayed on the reservation. She taught by day, and at night she would visit artists’ houses on the Pueblo and help them consign their art. Eventually, a healthy inventory was developed. Unfortunately, after a couple of years in operation, the shop manager’s lack of ethics left the artists unpaid for their work and the books a mess. 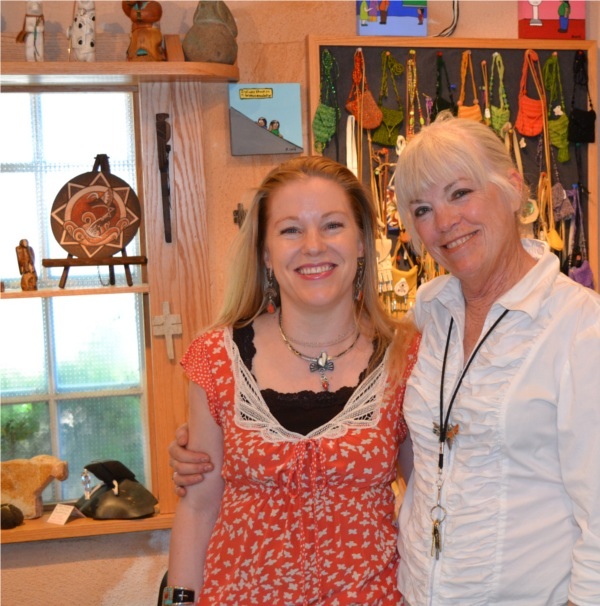 The co-op group asked Robin to take over the shop, and so she and Bronwyn moved back to Santa Fe. Robin spent a few years clearing up the books, mending relationships, and ensuring all the artists were paid their asking price for their work. For over 32 years, Keshi: The Zuñi Connection has been under the careful stewardship of Robin and Bronwyn. Bronwyn would work in the shop during summer breaks. After a number of years moving around the globe, and earning her degree in American Cultural Studies, she eventually settled in as manager in 1999. Today, Keshi represents the work of over 1000 Native American artists, 95% of whom are Zuñi. 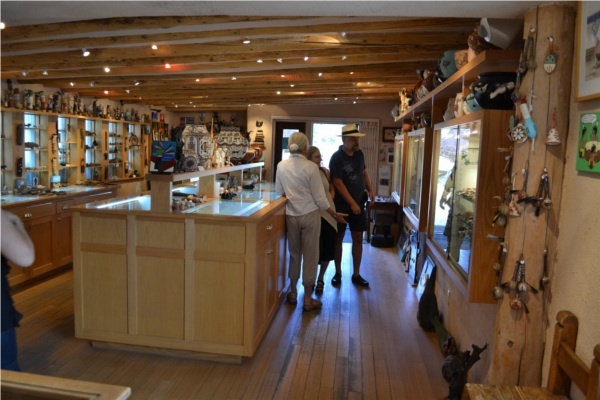 The 800-square-foot store is one of my favorites in Santa Fe. It stands alone amid the moat of a city parking lot on Don Gaspar Street, in the heart of historic Santa Fe, just two blocks from the plaza. The space is filled to the brim, housing one of the world’s largest Zuñi fetish collections. 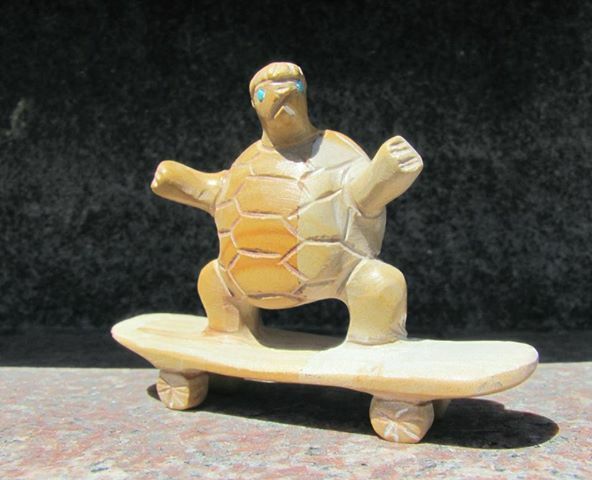 They also carry a variety of art, pottery and jewelry. The Zuñi are also renowned for their exquisite “petit point” jewelry. Robin told me that authentic petit point is fast becoming a rarity, and that buyers need to beware of the many forgeries that exist. 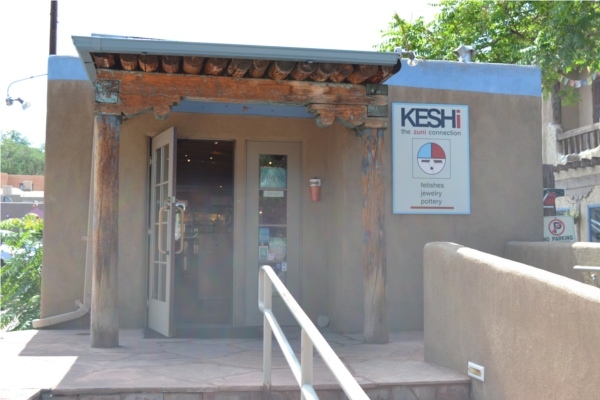 The extensive displays, coupled with the knowledgeable, friendly staff, make Keshi a place that offers you a sense of authentic connection and closeness to a deeply rooted spiritual culture and artistic heritage. DON’T FORGET TO FEED YOUR FETISH!! No, I don’t mean go out and buy a closet full of shoes. When you buy a fetish from Keshi, you’ll be reminded that Native cultures consider an important way to honor its power is to feed it. Corn is a vital staple in Native American culture, and so each fetish comes complete with its own little bag of blue corn meal. Sprinkle the meal on and around your fetish to ensure it is well fed, and it will care for you in return. For decades, the fetish has been a popular icon around the world. Attempts to pass off items made in China, Taiwan and elsewhere as the authentic article are rampant today. Robin and Bronwyn are happy to enlighten their customers on what constitutes authentic work. 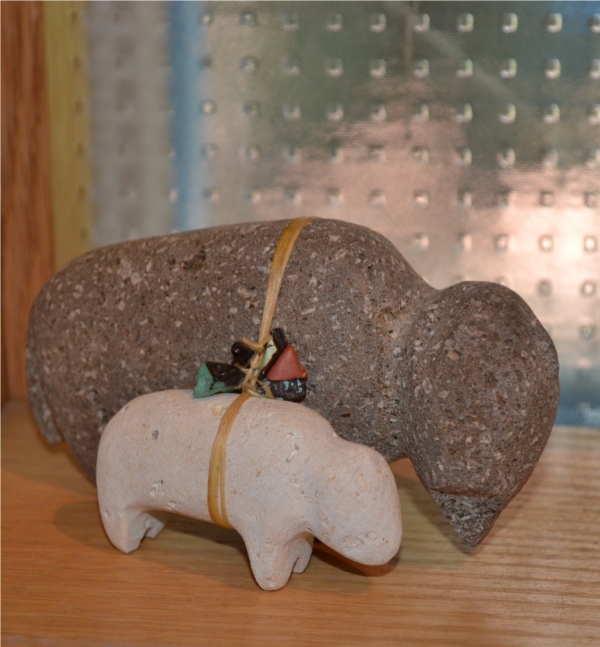 Rest assured, everything in Keshi is authentically Native American-made. Prices for genuine fetishes can be as low as $10 and range up to many thousands. 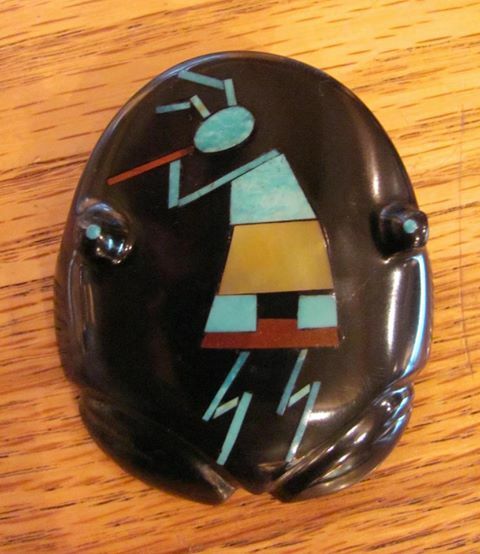 Fakes are no less expensive than the genuine article, which only serves to deprive the Native people of their just reward for their work, and the unsuspecting consumer of authentic Native art. I love giving fetishes as gifts to friends and family. 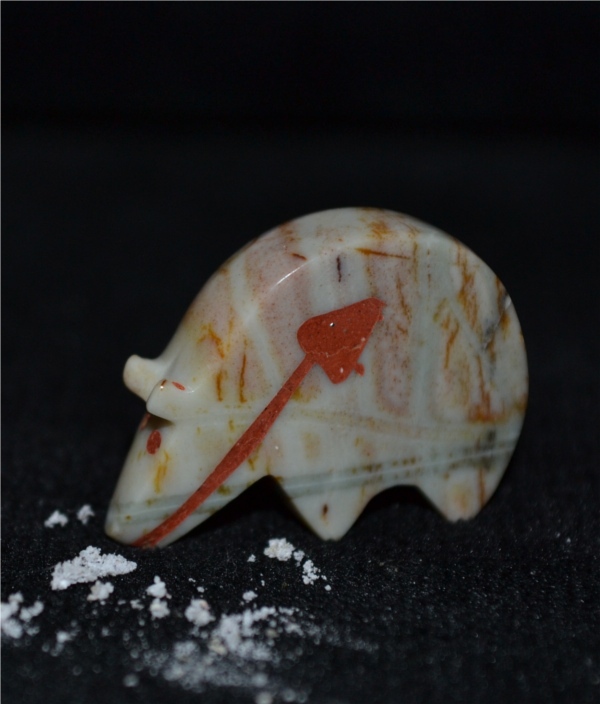 They represent that old adage, “good things come in small packages.” Though some of them may be as small as a dime, they are beautifully crafted from a multitude of rocks and gems, and many are intricately inlaid with beautiful designs. Whether large or small, each carries with it a special meaning, which makes them the ideal gift for anyone. 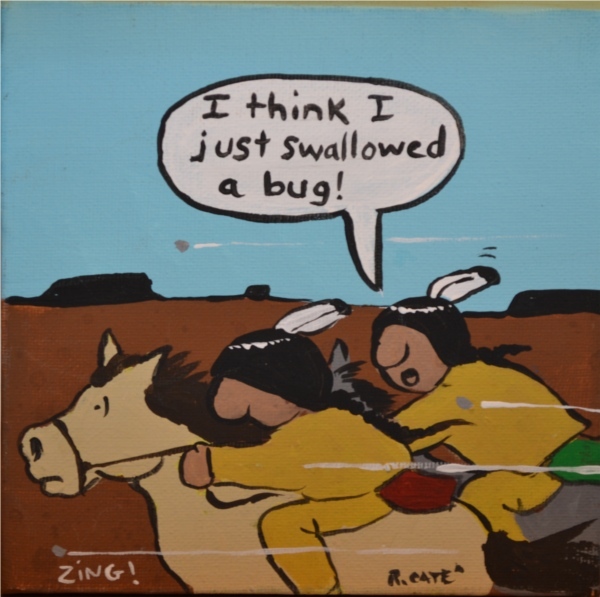 Native American comedian and comic strip artist Ricardo Lee Caté is also featuring his works at Keshi. Caté is of the Kewa tribe and is well known in New Mexico for his cartoon comic strips in the Santa Fe New Mexican newspaper called “Without Reservations”. It is well worth a visit to Keshi any time. They are open 7 days a week, Monday to Saturday 10 a.m. – 5 p.m. and Sunday 11a.m. – 5p.m. 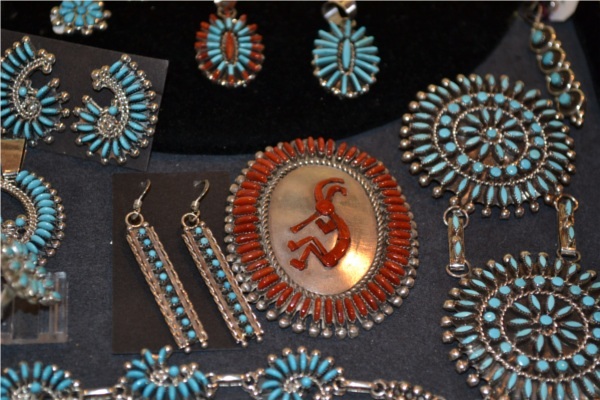 For more information on Keshi: The Zuni Connection go to: http://santafeselection.com/unique-shops/keshi-the-zuni-connection or call (505) 989 8728. This entry was posted in All Posts, Shopping, The Arts by Maria Johnson. Bookmark the permalink. An absolutely incredible piece! 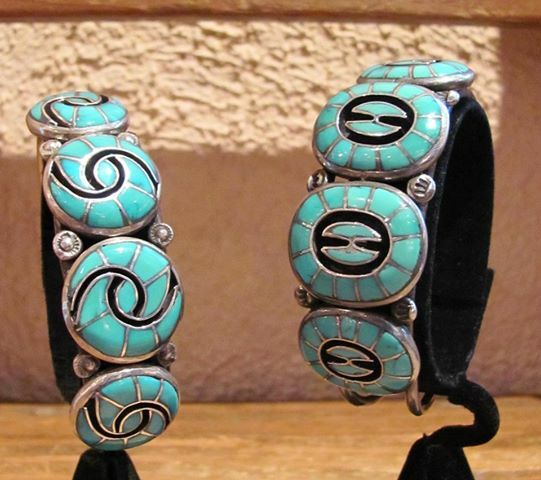 Kudos to Robin and Bronwyn for doing what they did for the Native Americans in general and Zuni in particular. And kudos to Maria for sharing this so eloquently. Our guests love Keshi. Click here to be notified about new posts by email.